Disappointments, even small ones, can be painful. And repeated disappointments can poison hope and lead to despair! I read somewhere, that shipwreck victims who lose hope might die after just a few days, even though physiologically they could have survived much longer! We all experience disappointments. They come in a variety of shapes and sizes and invade every area of our lives. Sadly, some people never recover from disappointments and resign themselves to going through life unfulfilled and dissatisfied. There will always be disappointments. God doesn't promise to shelter us from every little thing. Disappointments are a part of living in an imperfect world, and you need to learn how to get past them. If you don't, discouragement and devastation will never be far away. Deep hurt isn’t just a result of BIG disappointments. Deep emotional pain can start with a series of minor irritations and frustrations. That's why we need to know how to handle small disappointments effectively. If we don't, they can quickly be blown out of proportion and rob us of peace and much more. 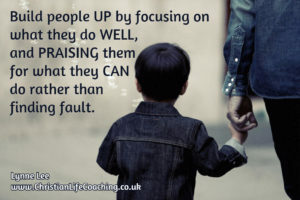 When minor frustrations pile up it can wear us down and seem as though nothing is going right. If, on top of that, the results from hospital tests aren't what you were hoping and praying for, and then you discover that you no longer have a job, how will you respond? Will you believe God's word and respond with faith, or will you respond with fear, and spiral into hopelessness and despair? In the first 50 years of Abraham Lincoln’s life tragedy and disappointments were never far away. When he was 7, his family lost their home, and he had to work to help support his parents. When he was 9 his mother died. He failed in business at the age of 21. When he was 22 he ran for the legislature, lost his job, and failed to get into law school. At the age of 23 he borrowed money to start another business, and by the age of 24 he was bankrupt. When he was 25 he was engaged to be married but his fiancé died. When he was 26 he had a nervous breakdown. At the age of 28 he was defeated as speaker of the state legislature. At the age of 33 he ran for Congress and lost. At the age of 38 he ran for Congress and lost again. When he was 44 he ran for the US Senate and lost. At the age of 46 he tried for the Vice President nomination but received less than 100 votes and lost. When he was 48 he ran for the US Senate again, and lost again! At the age of 50, he was elected as the 16th President of the United States! Life threw a LOT at him but because he didn’t give up, he managed to overcome major disappointments and losses, and helped change deeply rooted prejudices. You can either let disappointment be a massive weight and rob you of peace and joy, or you can press through, overcome, and do what you were put on earth to do. What do YOU do when disappointment knocks at your door? When it threatens to crush you, you can either let it weigh you down until you become discouraged or even devastated, or you can use it as a stepping-stone, learn to adapt, and grow as you stretch your faith muscles. You can do it! You can face disappointment, and you can overcome! 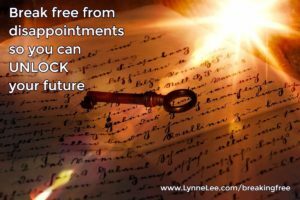 What are the disappointments that have been holding you back and keeping you stuck? Financial loss that you are still paying for? Business failure that broke your heart and took everything you had? A failed marriage and everything that goes with that? The fact that you are still waiting for Mr. Right while your friends are now having grandchildren? Promises that still fail to manifest after yet another year of believing for your breakthrough? Frustrating situations that never seems to get better whatever you do? Maybe you've forgiven the people involved, but the disappointment still nags away, keeps on costing you, and keeps you stuck. Until disappointments are FULLY resolved they will continue to rob you. Once you deal with them, you can break free of the crippling effects of disappointment and begin to experience God's promises. There IS light at the end of the tunnel! 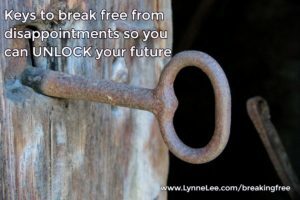 I invite you to listen to Breaking Free From Disappointments a FREE life changing seminar that will give you keys to help you break free from disappointments. You can keep on muddling along, doing what you've been doing, OR you can learn how to breakthrough and overcome disappointments that are holding you back. It’s not too late to stop the rot and discover how to find joy again! Take the first step by listening to this really helpful seminar, and consider what you will do to make sure you get unstuck and break through. I thrive on feedback. Please take a few seconds to comment below. Thank you! Lynne, this is a powerful post! The thought that we can be derailed by a ‘series of minor irritations and frustrations’ is a showstopper. I think we probably do a better job of preparing for big disappointments while ignoring the impact of the small ‘letdowns’. I know I’m really good when crises happen, but some of the smaller irritants, certainly can make me lose my peace. Thanks for sharing this! Allegra thank you for your encouragement and for adding insights. leaning on God! Thank you for the awesome post! You’re welcome. None of us are immune from disappointments… how we respond determines the quality of our life. Thanks Lynne for sharing this. It is insightful and thought-provoking. It is enlightening to know that Lincoln failed several times but never gave up. Cheers.